Your earphones will never fall out of your ears again! Mack's Earphone Anchors are made of a soft silicone putty that adheres to your ears, holding your earbuds in place, whatever activity you choose to engage in. Now you can take your music with you! 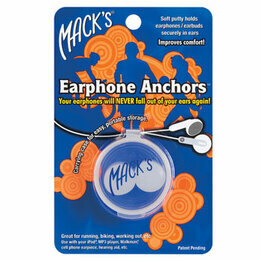 Mack's Earphone Anchors are a great solution for many different kinds of earpieces that you have trouble keeping in place including hearing aids, walkie-talkie earpieces, earbuds, cellphone earpieces and more. Each package contains one pair of reusable anchors in a sturdy carry case.